I had so much fun using the stencil monoprint technique on my Birds of a Feather layout that I used it again on this card. This is the Tim Holtz Doily stencil and I inked it up with Scattered Straw, Tattered Rose, and Worn Lipstick Distress inks. It has a nice watercolor effect. I also broke out one of my stamp/die sets for the flowers and tendril. I used to hate using stamps with matching dies because they were such a pain to line up. I now love using the Sizzix magnetic platform in my Big Shot. Those dies don't move at all and it's easy to line everything up. The coloring comes from embossing powders. For the flowers I carefully sprinkled the cranberry EP around the edges and pink EP in the middle so I could get a two-toned effect. The yellow is distress ink applied with a water brush after embossing. I hope you go and check out the new challenge. There are always lots of inspiring projects and if you link up your own project there you will have a chance to win $50 to spend at Inspiration Emporium! Looks marvelous! I love the colors and the stencil you used looks awesome! Great share Lisa! 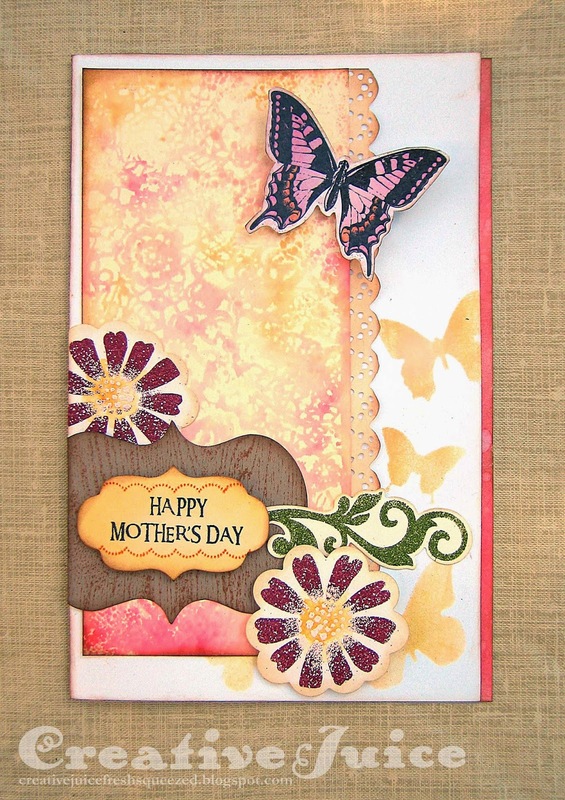 Beautiful card, love the soft colors and perfect for any mother!